Our Brigade of Chefs is in Wonderland!! The Grand Hotel Excelsior, Malta’s youngest and most vibrant 5 star Hotel has won the largest share of awards and medals for culinary excellence at the Malta Kulinarja 2013. 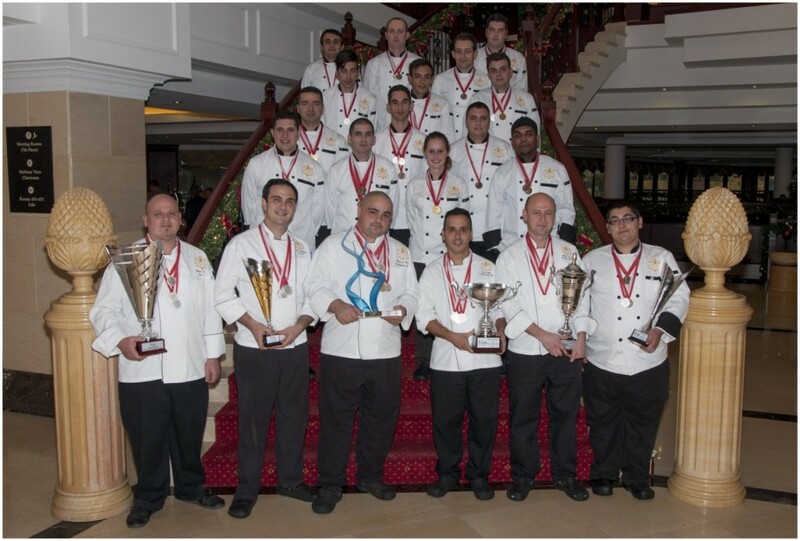 Under Executive Head Chef Roderick Vella’s leadership and his brigade of chefs, this Luxury Hotel in Malta has won the prestigious Parade de Chefs, Best Senior Competitor, Senior Practical team, the Pastry Chef of the Year, Junior Chef of the Year and over sixty culinary medals. Team Excelsior showed the talent, dedication, knowledge and highest 5-star standards of quality and presentation and won no less than five out of seven most valuable awards. This Christmas you have the opportunity to experience our 5-star excellence and discover a new culinary wonderland. For an outstanding dining experience book your table by making a reservation on 21250520 or email food.beverage@excelsior.com.mt. This entry was posted in Uncategorized on November 21, 2013 by Denise Camilleri. 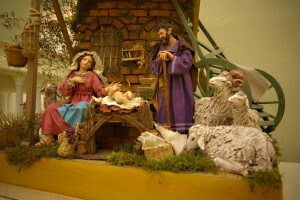 In Malta, the Crib is part of the Christmas season and tradition. It is believed that the very first Crib to be built in Malta dates back to 1617, and although there is no official document which can confirm it, the crib has been built every Christmas since. The design of the Cribs was influenced mainly by the Neapolitan style. 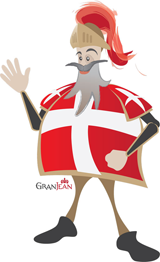 However, although this style was popular in Europe till the end of the last century, many Maltese disagreed with it, claiming, that such a style did not represent the Holy Night. The more acceptable style was that of Sicilian model introduced by Benedetto Papale, a Franciscan friar from Sicily, during the second half of the 19th century. Popularity of building cribs bloomed during the 19th and beginning of 20th century. The most common material used was the rustic stone, coal residue and eventually papier mache. Another interesting part of the crib, of course, are the statues called ‘pasturi’, which were made of arth clay or candle wax. The Maltese cribs are part of the local culture, so if you happen to be visiting our beautiful Islands during the Christmas season, be sure to see some. Nowadays you will find different displays of Maltese cribs in private homes, churches, and in exhibition spaces. Most of these cribs are hand-made and some are even life-size cribs. One popular life-size crib is “Bethlehem f’Għajnsielem” which is held at Ghajnsielem in Gozo during December. In fact the place (a 20,000 square meter of fields) is transformed into a nativity village where several volunteers take part in the reconstruction of the Christmas story. Witness horses turning mills, villagers going about their jobs, shepherds inhabiting caves, animals roaming in enclosed spaces and a poor unknown couple tending their newly-born in a grotto. The perfect Christmas atmosphere for all the family. Are you visiting Malta during Christmas and the Festive Season? Celebrate the Christmas spirit at a luxury 5 Star hotel in Malta. Should you wish to visit traditional Maltese cribs and experience the local Christmas atmosphere during your Malta holidays please speak to Our Concierge Team who will guide you accordingly. © Clive Vella & Viewing Malta. This entry was posted in About Malta, Christmas in Malta, Excelsior Hotel Malta, Feasts in Malta, Malta Feasts, Maltese Traditions, Things to do in Malta and tagged christmas in malta, christmas tradition in malta, maltese cribs, visiting malta on November 18, 2013 by Denise Camilleri. Take the plunge this Festive Season with Santa, Alice and the Wonderland Characters. Join us for the Grand Hotel Excelsior Santas’ Swim, this year in it’s 3rd Edition. 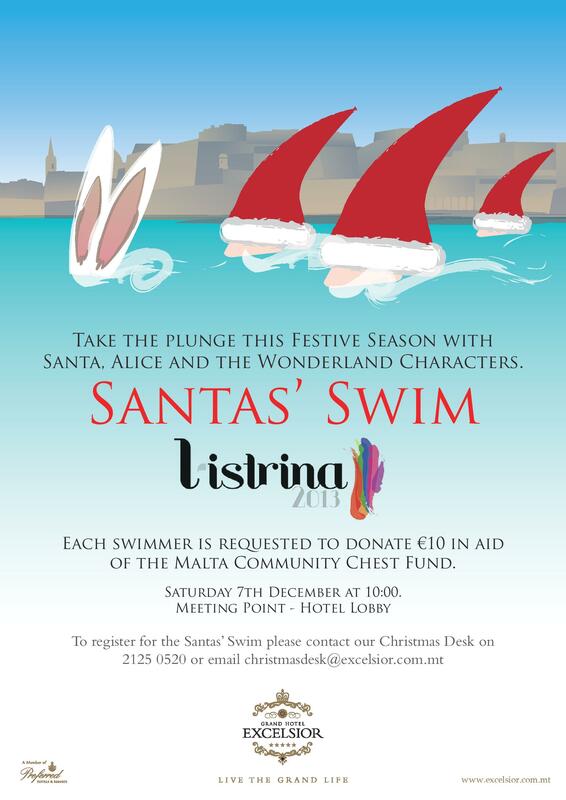 Each swimmer is requested to donate €10 in aid of the Malta Community Chest Fund. This renowned event will take place on Saturday 7th December 2013 at 10.00 hrs. Meet us at the Excelsior Hotel’s Lobby. Come on be brave, plunge into the sea and have some fun, all for a good cause!! 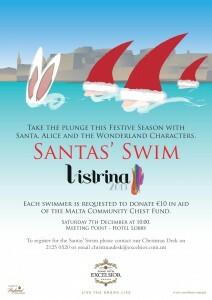 To register for the Santas’ Swim please contact Our Christmas Desk on 21250520 or email christmasdesk@excelsior.com.mt. The Grand Hotel Excelsior Team wishes a wonderful Christmas and a prosperous New Year to all its patrons, fans and friends. This entry was posted in Christmas in Malta, Excelsior Hotel Malta, Luxury Malta Hotel, Malta, Things to do in Malta and tagged charity, christmas, festive season 2013, l-istrina, malta community chest fund, santas swim, sea on November 13, 2013 by Denise Camilleri.